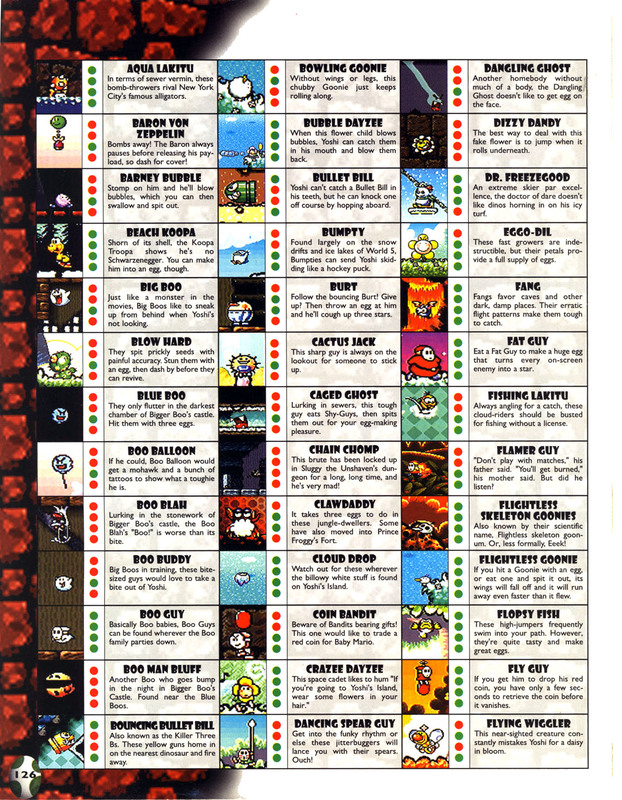 Bowling Goonie are wingless Hefty Goonies that first appear in Super Mario World 2: Yoshi's Island and Yoshi's Island: Super Mario Advance 3. Instead of flying, they slowly roll on the ground as their method of travel. Many Bowling Goonies are found directly on Yoshi's path, but some are the result of hitting a Hefty Goonie with an egg or swallowing it and then spitting it out. Bowling Goonies cause damage if they roll into Yoshi, but can be defeated with a Ground Pound or an egg. Yoshi can also walk on a Bowling Goonie as on a platform. Unlike Hefty Goonies, Bowling Goonies cannot be eaten. They are capable of rolling at the same speed on both horizontal and inclined surfaces and will roll off any edge that they encounter, continuing to roll on the surface underneath. Bowling Goonies return in Yoshi's New Island in the level Fine Feathered Friends or Foes?. They behave and can be interacted with almost exactly like in their original appearances, the only difference being that natural Bowling Goonies will turn the other way when they encounter an edge of any kind, but those that are spat out by Yoshi will still roll off edges. Romanization of 「でぶあほーむし」 (Debu Ahō Mushi), effectively meaning "Fat Goon Bug"
↑ 「太りすぎて飛べなくなったあほ一どり。タマゴを当てたり、食べてはき出すと、つばさが取れて転がって行く。転がっている間も、当たればイタいぞ。」 ("An Aho Dori that became too fat to fly. When hit by an egg, or when eaten, the wings are taken off and it will roll along. While rolling, it is also vulnerable to hits.") 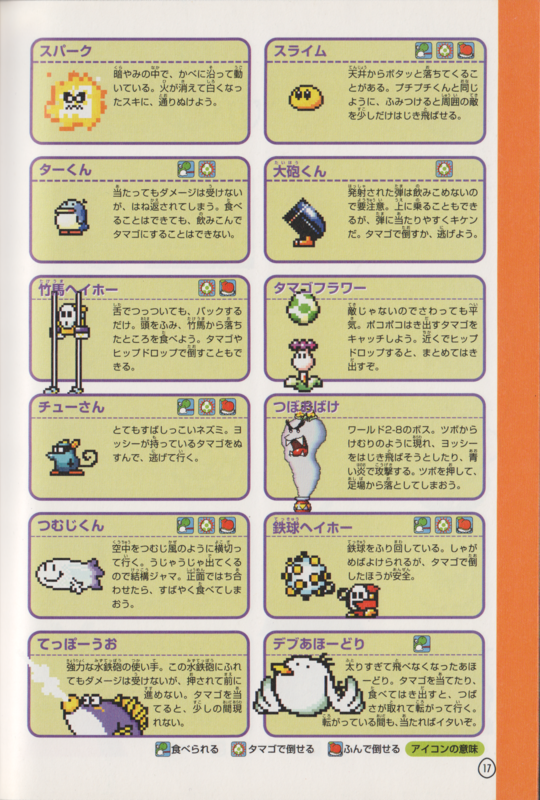 - 「スーパーマリオアドバンス3任天堂公式ガイドブック」 (Super Mario Advance 3 Nintendo Kōshiki Guidebook), page 17. ↑ 「ボールのように丸まったあほーどり。はずむように移動するものと、地箇を転がるものの2種類がいる。はずんで移動するタイプだけ、食べて口に含むことができる。」 ("A rolling Aho Dori that looks like a ball. Those that bounce to move, and those that roll on the ground consist of the two varieties. For the bounce movement type, it can fit in your mouth and be eaten.") 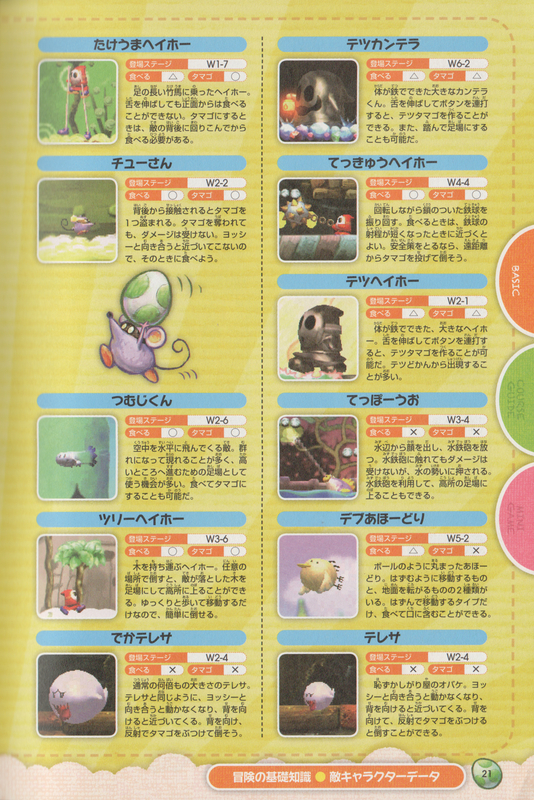 - 「ヨッシー New アイランド 任天堂公式ガイドブック」 (Yoshi's New Island Nintendo Kōshiki Guidebook), page 21. This page was last edited on April 11, 2019, at 18:06.